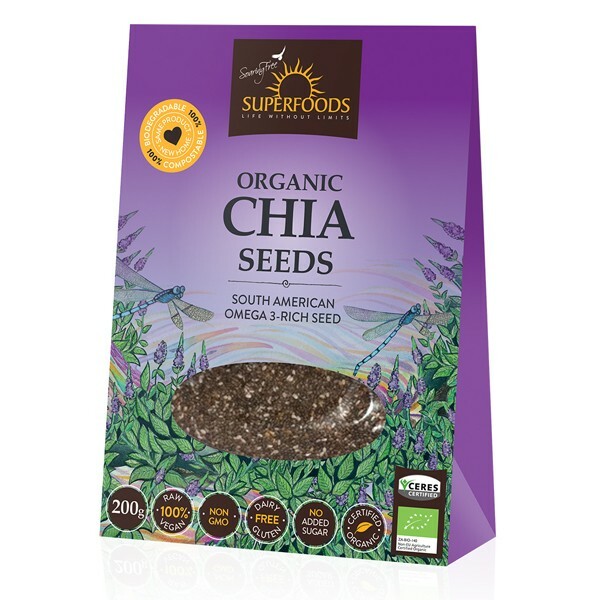 Chia seeds are becoming an ever more popular superfoo, thanks to their anti-inflammatory omega 3's and digestive soothing soluble fibre. Chia seeds, from the sage-family help with endurance and fitness, and stabilisng blood sugar. This versatile little seed is a near complete food with its unbelievable nutritional profile. Add chia seeds, to your diet – you can't go wrong. Chia means strength in Mayan and has over 3000 years of history as an ancient revered crop. Used by messengers who needed to cover ground swiftly, chia seeds were known as ‘the runners food’. The seeds of this sage-family plant have a spectacular nutritional profile making it a near complete food, providing high levels of energy, protein and dietary fibre and very high levels of Omega 3 fatty acids. Chia seeds have a mild and pleasant taste and can be added to recipes to provide more bulk and nutritional density. Chia will absorb up to 10 times its volume in water within 5 minutes. You can create a quick chia porridge base by adding water to chia in this way. You can also add chia seeds directly to your smoothies or juices, mix it into soups or sauces as a thickener, create power-packed energy bars, crackers or delicious creamy desserts. Mix 1 cup Chia seeds with 4 cups water to create a gel and store in a glass jar in the fridge. Use by the spoonful as required.